The Azawakh originated in Africa, where they were used for hunting and as guard dogs. They are named after the Azawakh Valley. Some folk pronounce it "Ozawok." They have been known from ancient times in the whole Sahel region - Mali, Niger and Burkino Faso. The dogs had to be tough to survive in desert conditions. The nomadic Tuareg tribe is credited with developing the breed, though other people groups also contributed. 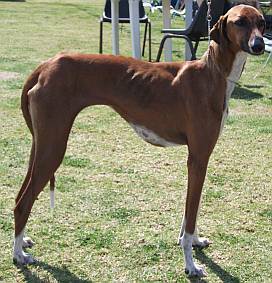 The Azawakh resembles a gaunt greyhound, and is a fast runner. It is an exceptionally lean dog, whose ribs and pelvic bones protrude. Azawakhs are "sight" hounds, meaning they see the prey moving and give chase. Other types of hounds are "scent" hounds, eg bloodhounds, who follow trails with their nose. These dogs are loyal to their owners, but do not like strangers touching them. The tail is long and thin, with a white tip. The ears droop down. Neck is long & elegant. They are high on the leg. Colour: usually shades of brown from sand to red, or brindle, with white socks and white chest. Some have a black saddle and some a white blaze on the face. Height at shoulder: males - 64 - 74 cms, females 60 - 70 cms. Weight - males 20 - 25 kg, females 15 - 20 kg. Map of North Africa. Click on the map to make it bigger. Azawakh means, "Land of the North." The Timbuktu (French: Tombouctou) region of Mali is to the North. Azawakhs are economically built: no surplus fat. They had to be lean and fast to survive in the desert. Their life with the nomads reminds me of the Jews who trekked through the desert from Egypt to Israel. They could have starved, but God provided them with food. John 6, 31. Today we get food easily. Let's be thankful!